this weekend louis palmer, organizer of WAVE2011-2013 (TW560 took part in WAVE2011, in india) wanted to end the current WAVE with a challenge: beat the current world record bringing together as many electric cars as possible. the current world record stood at 255 vehicles. in any case, we TWIKE pilots were here in force! 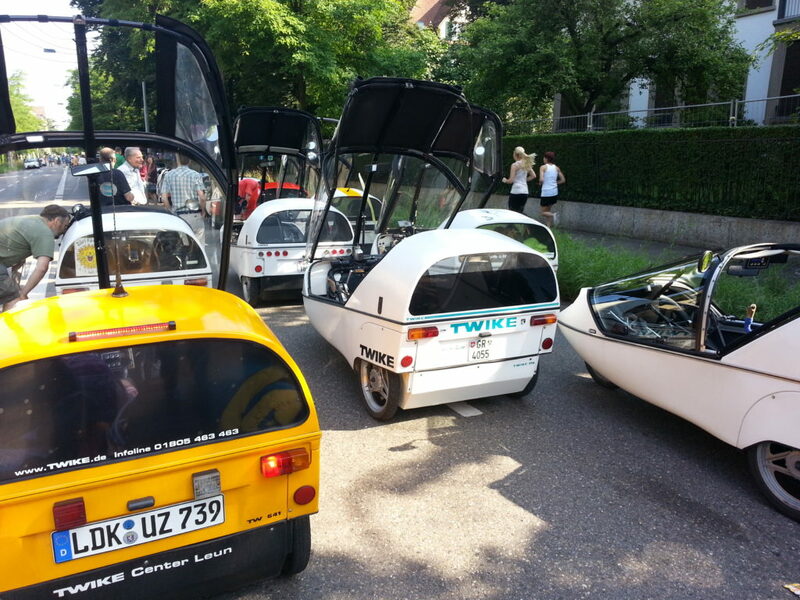 about 60 TWIKE’s were to be found in the line-up. a very frustrating piece of news spread quite quickly: guinness adjudicators had deemed the TWIKE to be a hybrid! 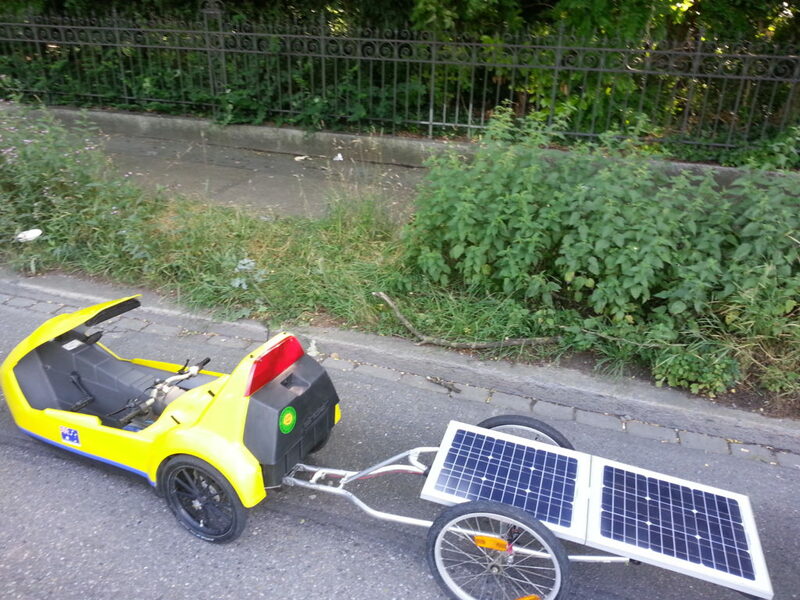 and therefore would only count TWIKE easy vehicles (the ones without pedals). 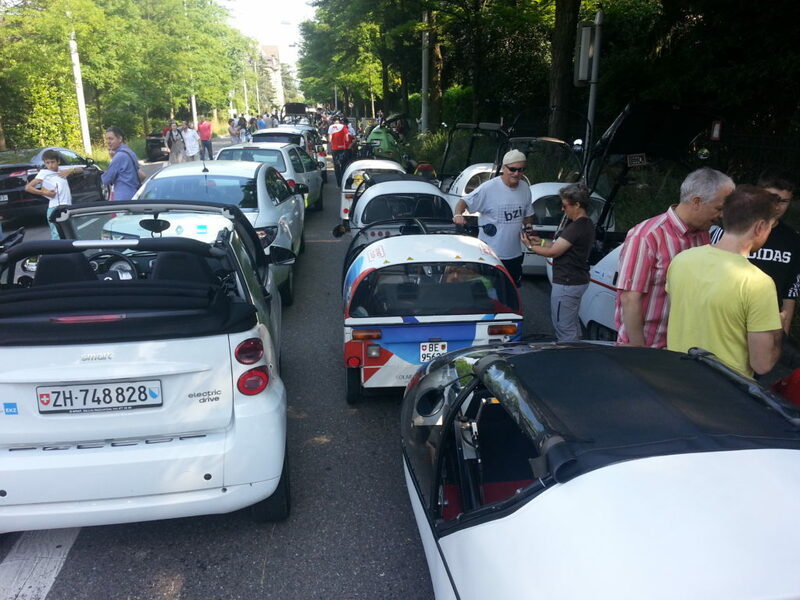 given the vast amounts of electric cars lined up i was sure louis palmer was relaxed – i estimated about 350 vehicles were present – minus us TWIKEs meant the record would be beat anyway! we all walked up and down the line to marvel at all the various models and engineering ingenuity, wonder how far some of the vehicles travelled to be here (northern germany, czech republic, croatia, spain), plus to see some much loved veterans such as the sinclair c5 or a fuel cell bike (which was obviously not counted towards the record attempt). now that’s how i like a hummer! then, after returning to the TWIKEs i spotted a very special TWIKE: TW560’s twin sister TW560! 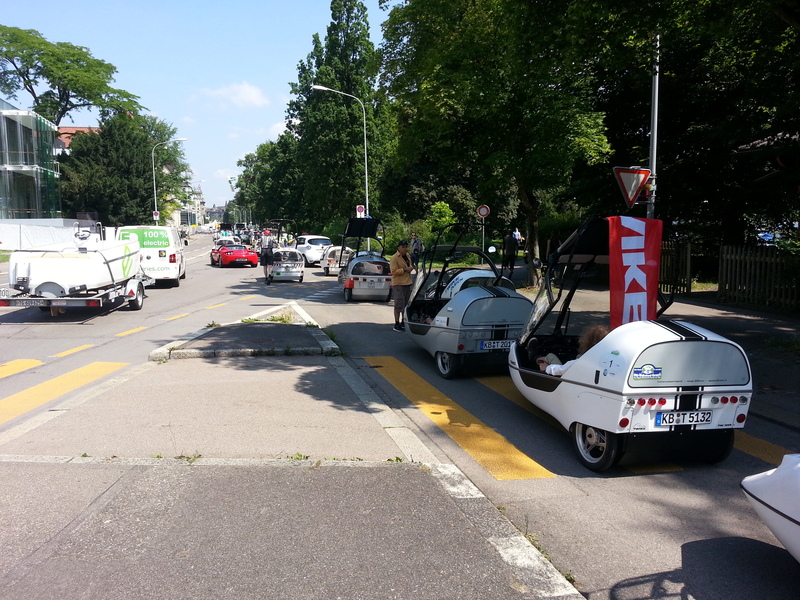 the very kind owner and i had a chat and she told me that it had been very surprising for her in the past to read about “her” TWIKE being on so many adventures… later that day we would take some very memorable pictures with both TW560’s side by side. 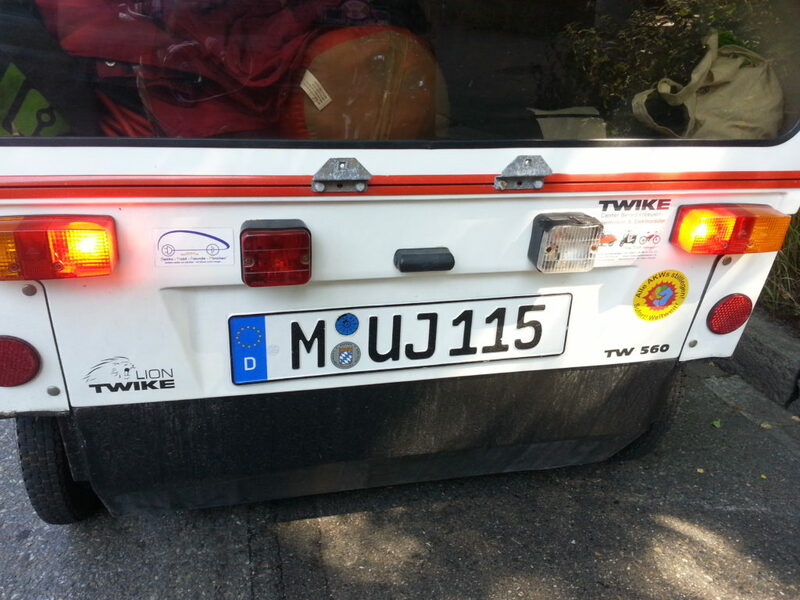 only very few TWIKEs have duplicate numbers – this owes to the fact that in the past there was a very short period where TWIKE’s were assembled by TWIKE service partners at the same time as they were produced in switzerland – due to poor communication, some TWIKEs were produced twice and this makes some meetings very interesting for a select few owners! then, around 1030 we all were asked to get ready to drive the 2.5kms from uto to enge and back twice for the record to count. 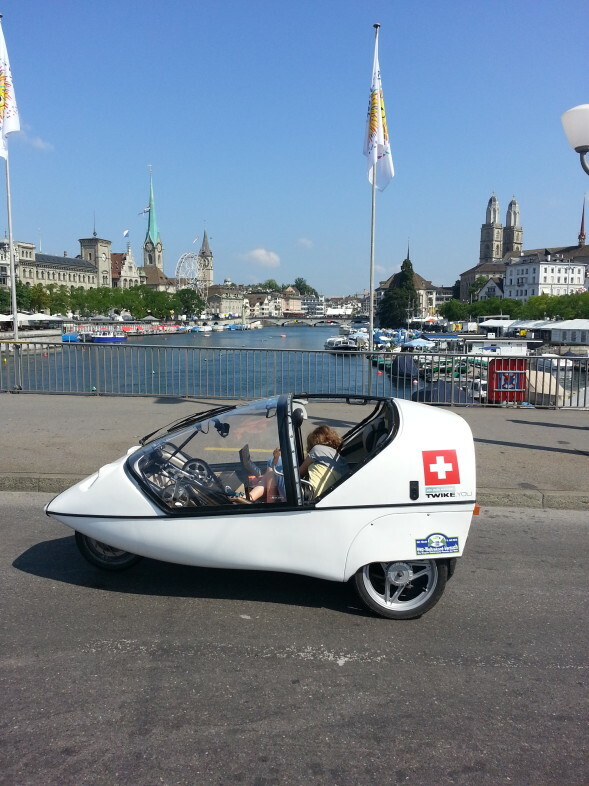 we were soon in a very serious traffic jam (100% ev’s) and this gave us the opportunity to take some very nice pictures with zurich’s old city as a backdrop. we made it to enge and still were stuck in a traffic jam. at least we got to see the heaviest and longest participant vehicle (and speed boat!). after 90 minutes, on returning to the same ewz-sun-arch, we were greeted by a jubilant louis palmer who confirmed to us that 383 ev’s were counted toward the record – congratulations, louis. 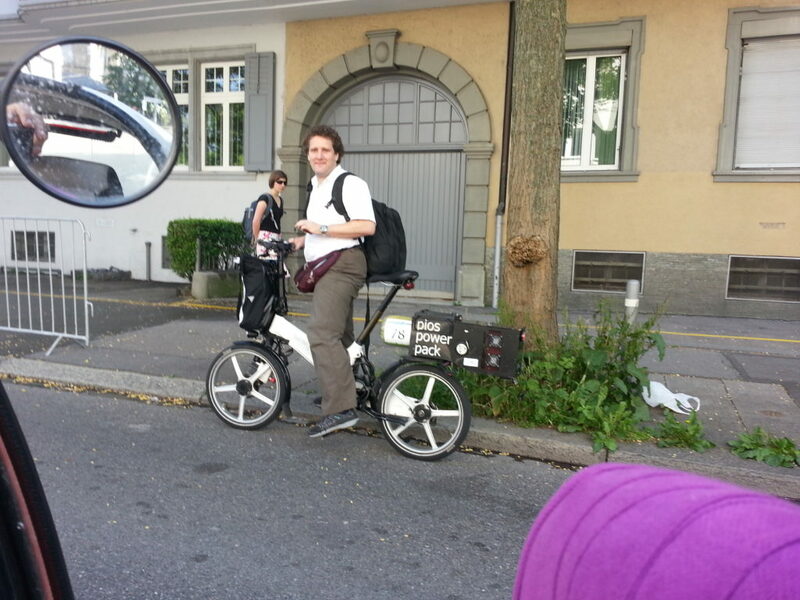 for us all it just was fun to see that we are not alone on our roads – i usually come across 1 electric car per day. although this is much more than just a few years ago i still feel quite unique driving an ev. 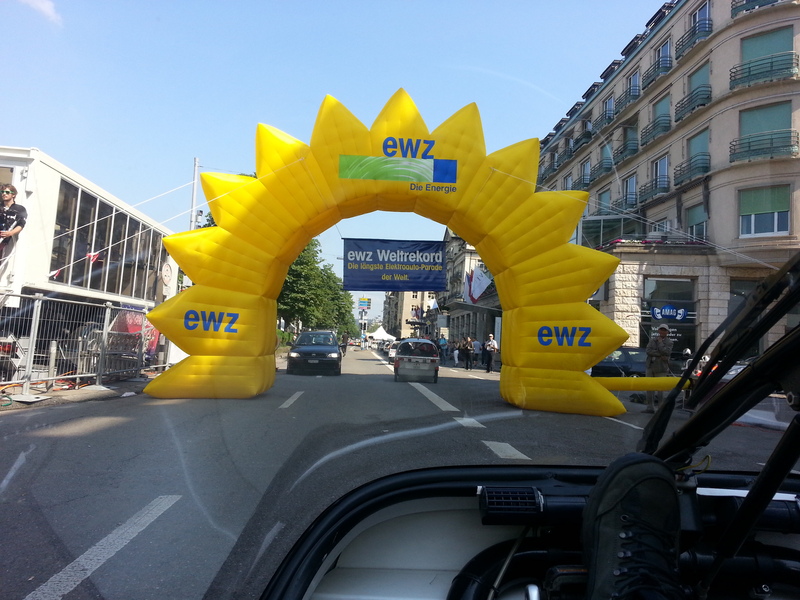 let’s hope events like this one helps to promote electric mobility!